Are you considering adding an open porch to your Kansas City area home? Options and considerations for adding a covered porch to your home. If you are considering adding a porch to your Kansas City are home but find yourself undecided on the specific style of porch that might better suit your lifestyle, we can offer insight. 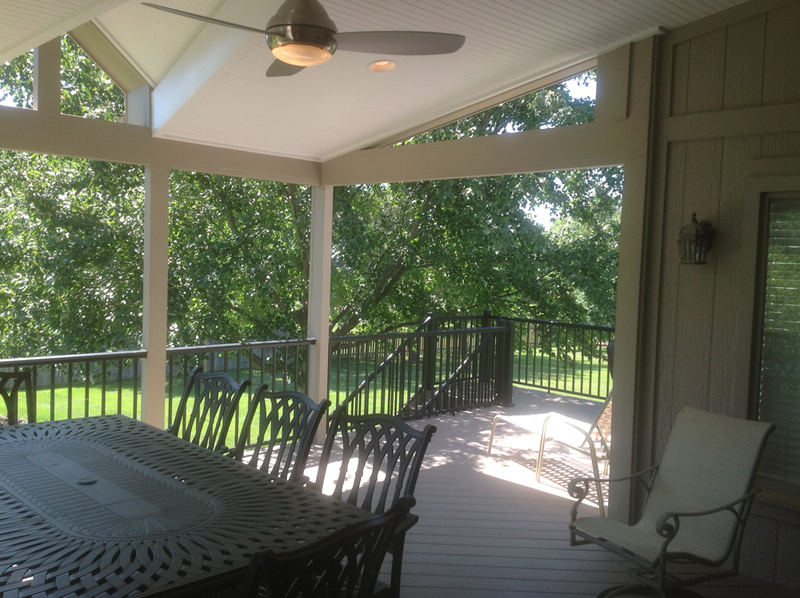 What are some benefits of adding an open porch versus a screened porch? In terms of style, some people prefer the simple charm of an open, covered porch over a screened-in porch. When function is a consideration, open porches allow for a better view from within and have a more open-air feel than a screened porch. An open porch is also easier to navigate if you often use it to get to your backyard, so ease of access is also a functional consideration. Thinking of building a porch atop your existing deck? That likely isn’t possible. Read more. Transforming your existing deck into a covered porch would be ideal if your deck was built to support such an addition. Unfortunately, almost all decks are not designed nor built to support the weight of a roof. Outside of not being able to support the weight of a roof, other obstacles include whether your deck is already the correct size and shape that you would like for your porch to be and whether it is attached to your home, where it is most convenient and usable. Perhaps your deck is outside your breakfast nook, but you would rather have your covered porch as an extension of your family room. When investing in an outdoor living space, it’s important to consider where you will get optimum use. If your open porch is not in an area you deem easily accessible, or sensibly placed, you are less likely to spend time there. When it comes to enjoying time outdoors, a covered porch is a great option for many reasons. You might find that an open porch enhances the overall experience of being outdoors, in that it is a true open-air living space, as opposed to being enclosed with screens. The second benefit is that even though the porch is open, you will still have some sun and rain protection on your covered porch. Porches are also versatile. They can host dual-purpose living areas, or be appointed an exclusive function, such as an outdoor TV room. Adding a fireplace to your covered porch will allow even more time outdoors. You might find it enjoyable to host a movie night by your fireplace on crisp evenings. If your family already gets ample use of your backyard, having an open porch is an obvious solution, as there are little or no boundaries between your porch and yard. This might be especially useful for families with pets. Open porches can add value to the way we use our existing outdoor amenities, such as play yards or grilling areas. As your Kansas City open porch builder, Archadeck of Kansas City can help you plan and build a porch to best suit your lifestyle. 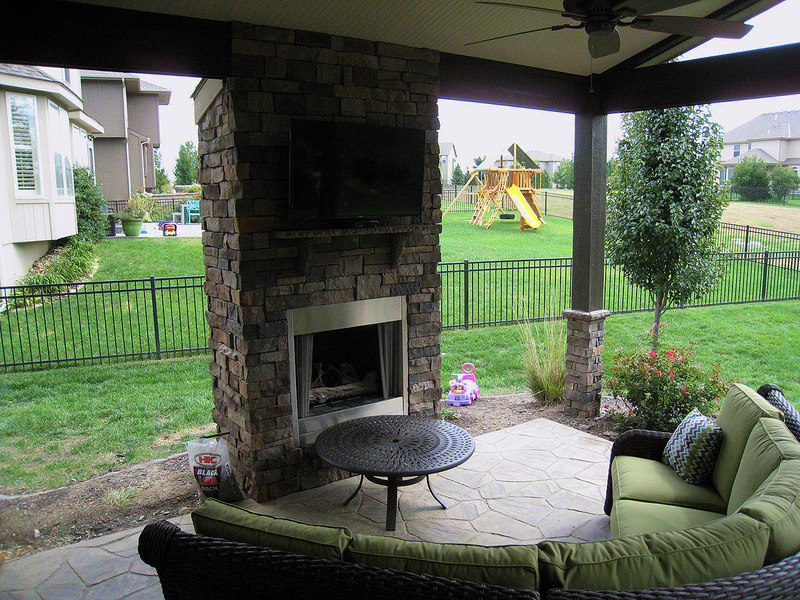 As your Kansas City covered porch builder, we can provide the ultimate outdoor living space for your home and family. All open porches are not created equal. We can offer many stylish and functional open porch options to suit your home and lifestyle. One of those options is maintenance level. Many Kansas City homeowners choose low-maintenance materials for their new covered or open porch. We can use low-maintenance building materials, such as AZEK composite decking and aluminum railings to ensure your time outside is spent enjoying your space. 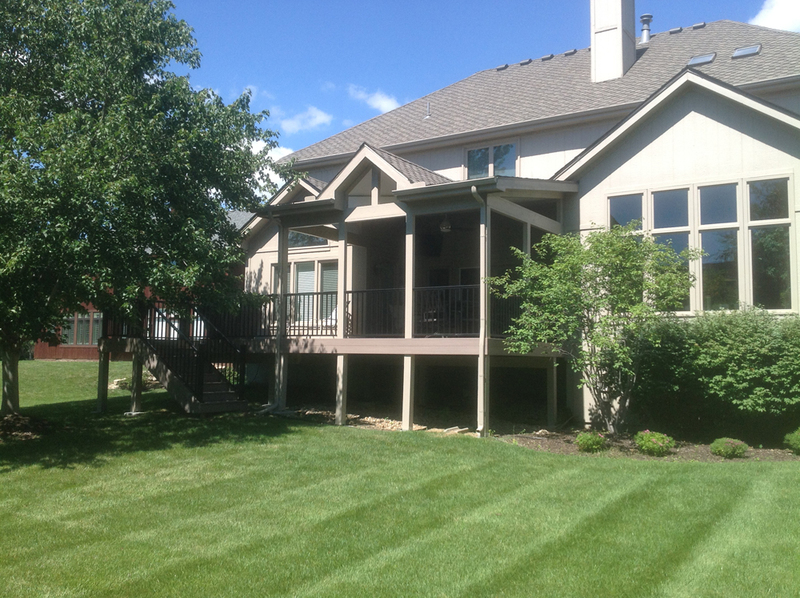 This Overland Park home was treated to a low-maintenance open porch with AZEK deck flooring and aluminum railing. The small, uncovered section of this porch will serve as an ample grilling area, while the covered area is perfect for eating and relaxing. The painted wood framing is a perfect match to the exterior finish of the home, and the white ceiling with inset lighting adds an air of modest cleanness. A lighted ceiling fan is a stylish and functional finish for enjoying the space on warmer days, and after dark. If you have been thinking about adding a covered porch to your Kansas City area home, we can help with important decisions about the design and function of your new outdoor living space. 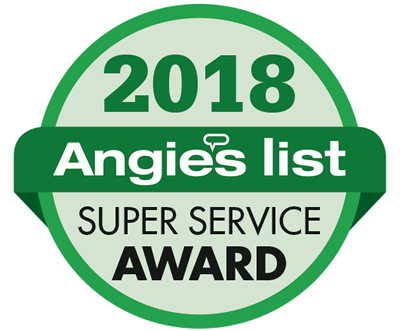 Give us a call at 913-851-3325 or email us for a free consultation. This elevated porch in Kansas City is perfectly suited to this large custom home and spacious backyard. 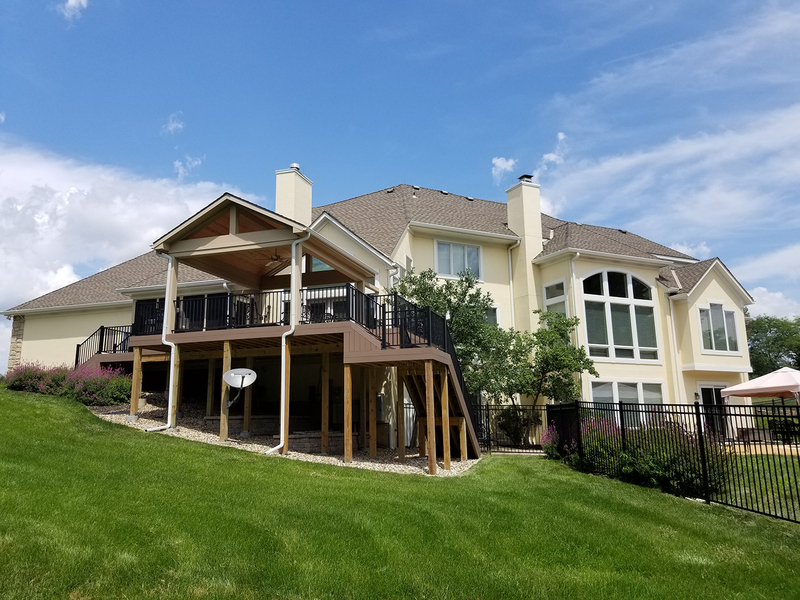 Featuring AZEK decking and fascia detailing and Fortress aluminum picket railings, this outdoor living area will be virtually maintenance free. There are two stairs to accommodate traffic flow for large get-togethers. Each stair has a landing, allowing for easier navigation to and from the sloped yard. The porch roof is inset with tongue and groove wood slats for a true custom aesthetic and features a ceiling fan for optimum airflow on warmer days. The painted beams and posts help this porch appear original to the home. Gravel and small stone retaining walls underneath will allow for covered storage and clean access to utilities. The beauty of this open porch is in its simplicity. The porch appears original to the home’s style and is unobtrusive to the exterior design of the home. Inconspicuously situated among the trees in the backyard, this porch offers privacy without feeling closed in. The aluminum picket railing blends and offers an unimpeded view beyond. The painted wood beams and supports match the house perfectly, and the porch’s roofline keeps with the home’s original design. The uncovered area serves as a grilling nook, while the covered area provides areas for eating and relaxing. A ceiling fan will help keep the homeowners cool on warm days. Gravel underneath the porch will keep the area tidy and usable for outdoor storage if needed.